SCVHistory.com | Placerita White Oil, Piru Oil Displayed at 1901 Pan-American Exposition (World's Fair). 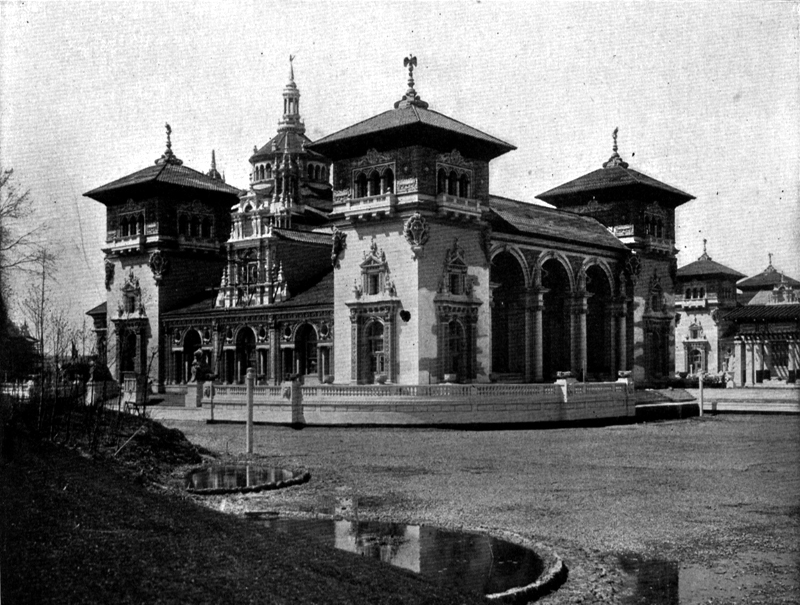 1901 Pan-American Exposition (World's Fair). By Leon Worden | January 3, 2015. 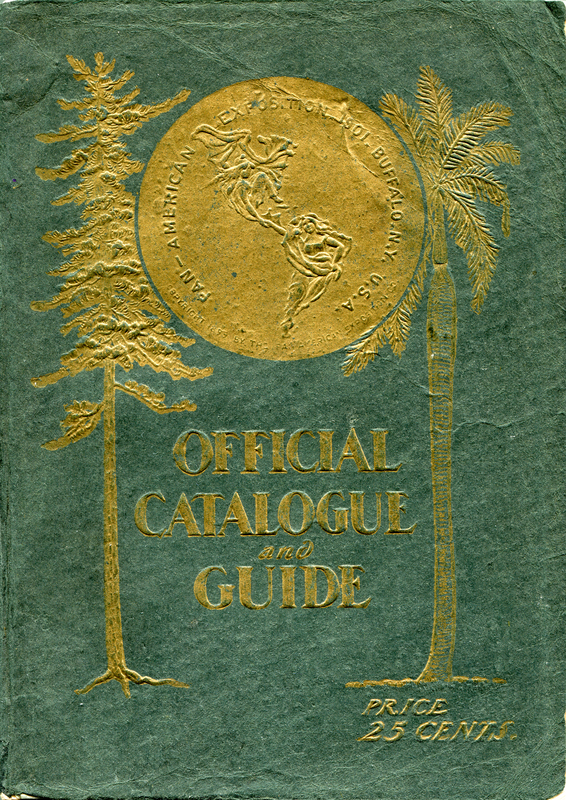 Cover to the 176-page version of the Official Catalogue and Guide to the 1901 Pan-American Exposition. Click to enlarge. What to expect in the Mines Building. Page 106 of the 176-page version. Click to enlarge. The 150x150-foot Mines Building. From "Official Views of Pan-American Exposition" by C.D. Arnold. Click to enlarge. 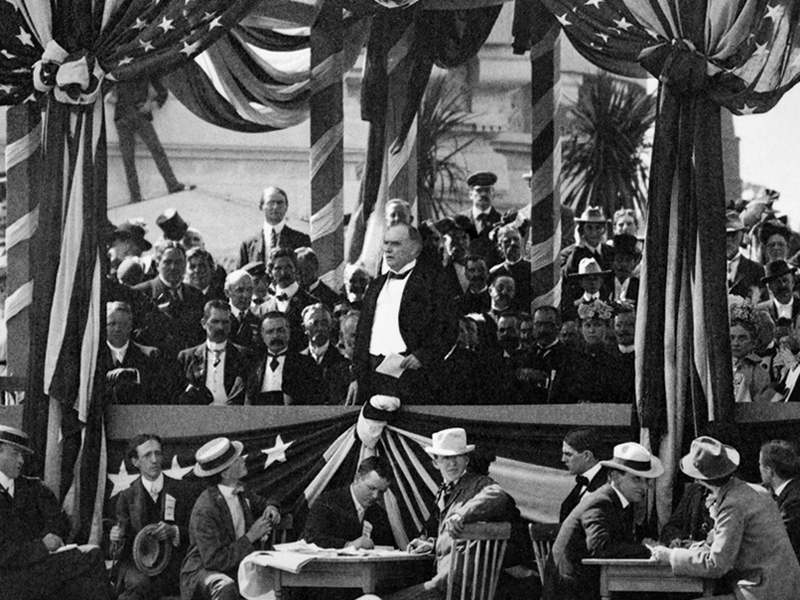 President William McKinley delivers his last public speech at the fairgrounds, Sept. 5, 1901. He was shot the next day and died Sept. 14. Click for full image. Some of our local history books tell us Placerita "white oil" — so clear, you could read a newspaper through it — was a big hit at the 1876 Philadelphia Exposition. That's unfortunate, because Placerita white oil wasn't discovered until about 1899. But there's a kernel of truth in most stories that go awry over the years, and so it is with this one. They had the right idea; they just had the wrong World's Fair. Placerita white oil was displayed at the 1901 Pan-American Exposition in Buffalo, N.Y., aka the 1901 World's Fair. That's the one where, on Sept. 6, President William McKinley was mortally wounded by the anarchist assassin, Leon Czolgosz. We know the strange stuff from Placerita was displayed there because the New Century Oil Co. was one of the exhibitors. The timing of the drilling might explain why New Century apparently was a late-comer to the Pan-American Exposition. One version, likely the first, is just 48 pages and probably doesn't list exhibitors. A second version is 176 pages and includes exhibitors. We learned the hard way that New Century Oil Co. isn't listed there. But New Century does appear in the final(? ), 224-page version, where it's listed as an exhibitor in the Mines Building. Just like the men who extracted gold from the ground, the men who extracted black (or white) gold from the ground were called "miners" back then. So the Mines Building showcased a wide variety of "ores, iron, copper and nickel, gold, silver, etc. ; limestones, marble, sandstones, trap [basalt], building and ornamental stones, petroleum products, salts, mineral paints, clay, brick, tile, etc." Most exhibitors hailed from the East Coast of the United States and Canada, but by the time the 6-month-long fair got underway May 1, Nevada and Oregon were well represented in the Mines Building. A paltry 22 of the more than 900 mining exhibitors hailed from the Golden State, including the California State Mining Bureau, U.C. Berkeley and the San Diego Chamber of Commerce — but New Century Oil wasn't the only one from the Santa Clarita Valley. The Piru Oil & Mining Co. was also there — and incidentally it signed on sooner than New Century because it made it into the intermediate, 176-page version of the catalog, even though it, too, got its start around 1899. • The Alcatraz Company of Los Angeles: Refined asphalt. • American Asphalt Co. of Los Angeles. • Banning, Hancock of Los Angeles: Serpentine marble. • California: Collective exhibit of ores from the State Mining Bureau, San Francisco, A.L. Cooper, state mineralogist. • Easton, Eldridge & Co. of Los Angeles: Crude oils. • Franklin Refining Co. of Los Angeles: Oil and mineral exhibit. • Home Oil Co. of Whittier: Crude oil. • Loma Blanca Lithographic Stone Co. of Los Angeles: Lithographic stone. • J.H. McKnight of Corona: Glass sand. • Piru Oil & Mining Co. of Piru: Crude oils. • Puenta Oil Co. of Los Angeles: Models of oil wells. • Puerite Oil Co. of Calif.: Model oil wells. • The Rex Oil Co. of Los Angeles: Crude oil. • H.M. Russell of Los Angeles: Gold quartz. • San Diego Chamber of Commerce: Lipidolite, lithia and mica. • Southwest Miners Assn. 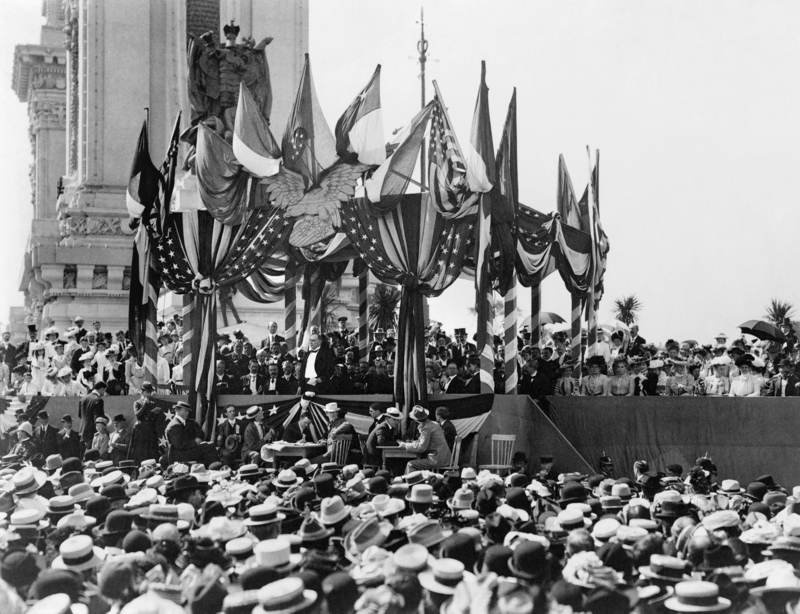 of Los Angeles: Specimens of gold, silver, lead and copper ores. • E.L. Swayne of Los Angeles: Crystal salt. • University of California, Berkeley: Publications. • Yucca Mfg. Co. of Los Angeles: Aslphalt. • Yukon Oil Co. of Los Angeles: Crude oils. If 900-plus exhibitors in the Mines Building seem like a lot, consider that there were 18 main buildings and dozens of outdoor exhibit spaces, and the Mines Building wasn't one of the bigger ones. One day we'll have to inspect the lists of exhibitors in the other buildings.